The only way to protect investment done in your car is getting it professionally appraised. When we talk about the auto appraisal, Chicago Auto Appraisers is the leading company to offer top-notch services. We offer an array of appraisal services that include diminished value appraisal, actual cash value appraisal, loss of use, total use, early lease termination, pre-purchase, bonded-lost title, estate, and bankruptcy. Chicago Auto Appraisers provide vehicle valuation representation including arbitration representation and expert witness. With our years of expertise and credentials, we offer professional, standard and competent vehicle value representation to our clients. We strive to provide the most extensive and accurate documentation to help them present the real value of their vehicle. We not only say but also help our customers accomplish their goal, be it finding the dream vehicle, improve insurance restitution and insurance coverage. Chicago auto appraiser was founded in the year 2007 and the management has been involved in the automobile business since 1980 from Sales to leasing. The company is licensed and insured since its inception. 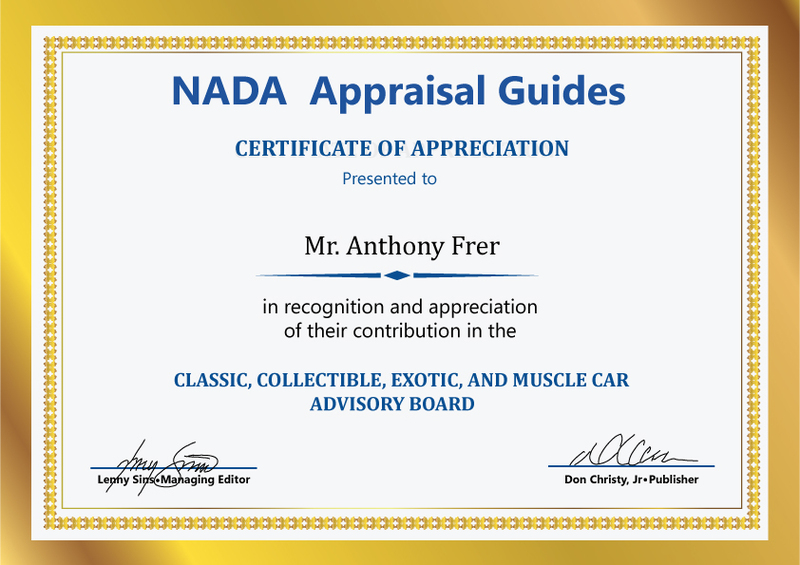 The founder Anthony Frer was the member of the International Automotive Appraisers Association member #1002010006 and NADA Advisory Board. He has been an auto mediator and umpire for auto mediators association. He has also worked as an expert witness at Illinois. We have always provided best services to our esteemed clients. We have satellite offices throughout Illinois and Southern Wisconsin. Our accurate and thorough appraising makes us the perfect choice in the business. We are trained to handle the whole claim process for you. Our certified inspectors perform a thorough inspection. We have more than 36 years of experience in appraising. We provide personalized customer service and certified agents. "Chicago Auto Appraisers are definitely the best professionals I have ever come across. They helped me got everything I wanted and probably more. 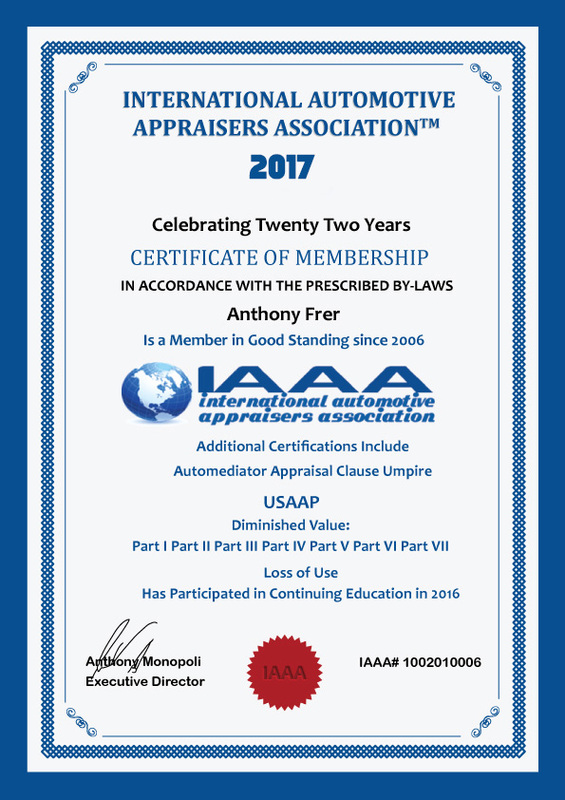 I feel overwhelmed in saying that I tried several other appraisers before contacting them and honestly, no one comes close to these experts. "Chicago Auto Appraisers is the best vehicle appraisal company my friends and me have ever dealt with. These professionals were able to expedite the appraisal process to meet our hectic schedule and get us on the road when we needed to be. I sincerely thank you for the genuine help. "My beloved car got damaged in an accident few months back. I was shattered and contacted many appraisers. However, none of them offered the right funds and were not even interested. That’s when I came across Chicago Auto Appraisers. These experts diagnosed the damages and helped me with appraisal value more than what I expected. "I had a beautiful experience with Chicago Auto Appraisers. These professionals are dedicated towards 100% customer care services and offer timely help. When not even a single appraiser was there to help me claim the right funds, these experts came to rescue and took me out from the terrible state.